Chili is a funny thing. Everybody’s got a recipe and no two are alike. Some focus on the chilies. Some on the meat. Some have beans. Some don’t. Some are closer to Mex. Some are definitely Tex. Some taste like spaghetti sauce with a bit of grocery store pre-fab mystery chili powder thrown in. Some I get. Some I don’t. 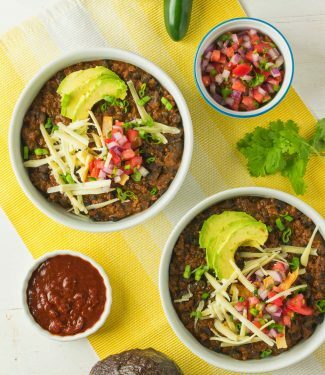 This black bean chili is one I get. I hope you get it too. This recipe is heavy on the chili. It’s not overly hot but the flavours are really big. There’s lots of chili flavour here. Lots. New Mexican red and chipotle are the dominant flavours. Ancho, tomato, cumin and jalapeño are the supporting flavours. It’s definitely on the side of Mex. It’s about layering great ingredients for depth. Pure chili powders, beef and pork, fire roasted tomatoes, and rendered fat. Don’t be scared of the rendered fat. It replaces the oil you would otherwise use. But it’s tastier. Every bit counts when you’re making chili. 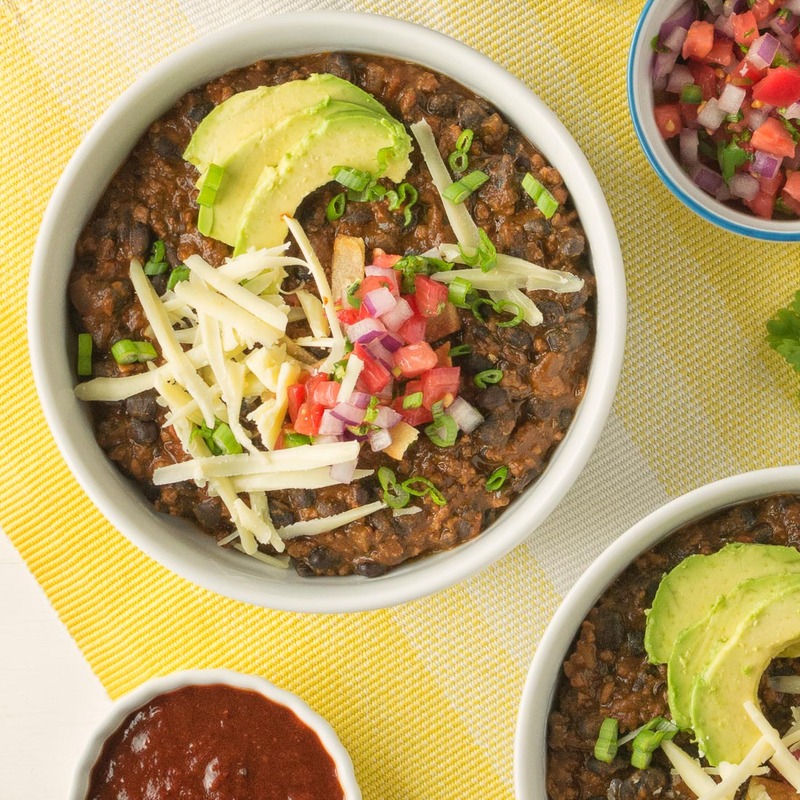 The key technique in this black bean chili is lifted from Indian cooking. Almost every curry starts with a masala. Onion, garlic, oil and spices are fried together. The spices bloom. The flavours meld. Magic happens. It’s exactly the same here. The spices are different but the chemistry is the same. 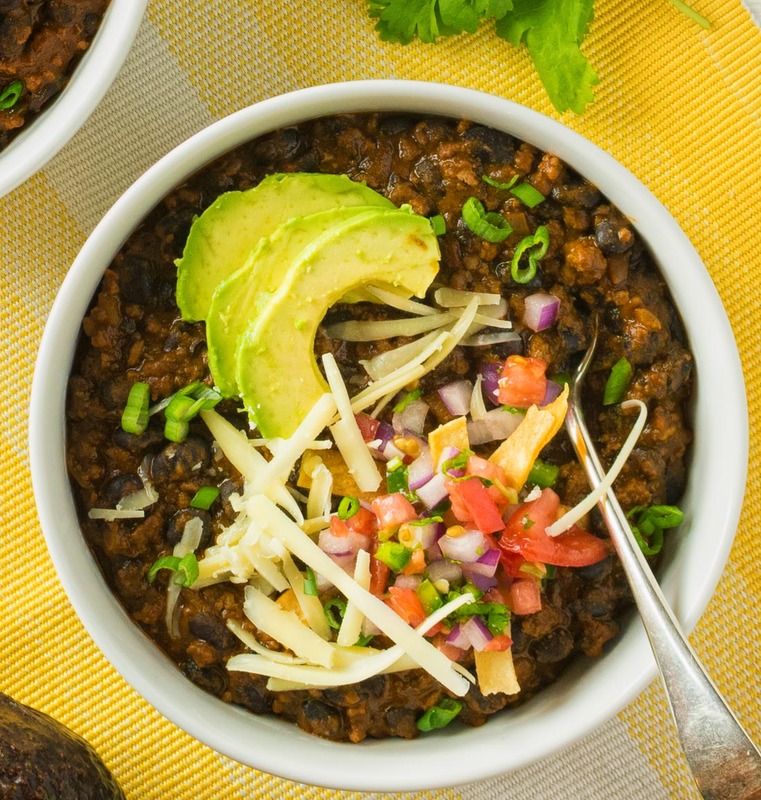 Black beans, pork, beef and good quality chili powder are the stars of this black bean chili. Cook the black beans if using dried. Drain and rinse the black beans if using canned. Heat the oil in a dutch oven and brown the beef and pork. When browned remove meat to a stainer or colander and drain and reserve the fat. Add 3 Tbsp of the reserved fat into the dutch oven. Sweat the onions and jalapeños if using over low heat until the onions are translucent. Add the garlic and cook another minute. Add the dry spice mix and cook over low heat for 2-3 minutes. Don't let it burn. If you cook Indian you'll recognize this as cooking the masala. Return the meat mixture to the dutch oven. Add the tomatoes and stir. Simmer, loosely covered, over low heat for about 45 minutes. Add the beans and cook, loosely covered, for another 60-90 minutes. Add a bit of stock from time to time to keep the chili from drying out. Add salt. The amount will depend on whether you are cooking them from dry (more salt) or canned (less salt). With dry beans it takes a surprising amount of salt so add a tsp at a time until you get to where you like it. Serve garnished with any of pico de gallo, sliced green onions, avacado slices, fried tortilla strips or sour cream. Whatever you feel like really. In american, beef, main course, meat, mexican, pork. Bookmark the permalink. Chili is one of my favorite soups to make. Yours is so delicious looking and different from what I normally do, I can’t wait to try it out! Pinning for later! This. Looks. Amazing! Beef AND pork AND beans??? I can’t think of a heartier or more delicious meal. Can’t wait to try it! Pork is a great addition to chili and one you don’t see often enough. It gives it a richness and lightens the flavour at the same time. What a great idea to cook the jalapeños, onion, garlic, and spices together to really bring out the flavours. The chili sounds so heartwarming and filling! Thanks for sharing! I’ve never added pork into chili before, it looks awesome. The spices and chiles look like it would give just enough heat, with really bold flavors. Can’t wait to try this one! Fire roasted tomatoes, rendered fats, ancho chilli powder — BIG FLAVOURS! What is there not to love?? This sounds divine! Where do you find your ancho chilli powders? I love how you mixed two different meats! 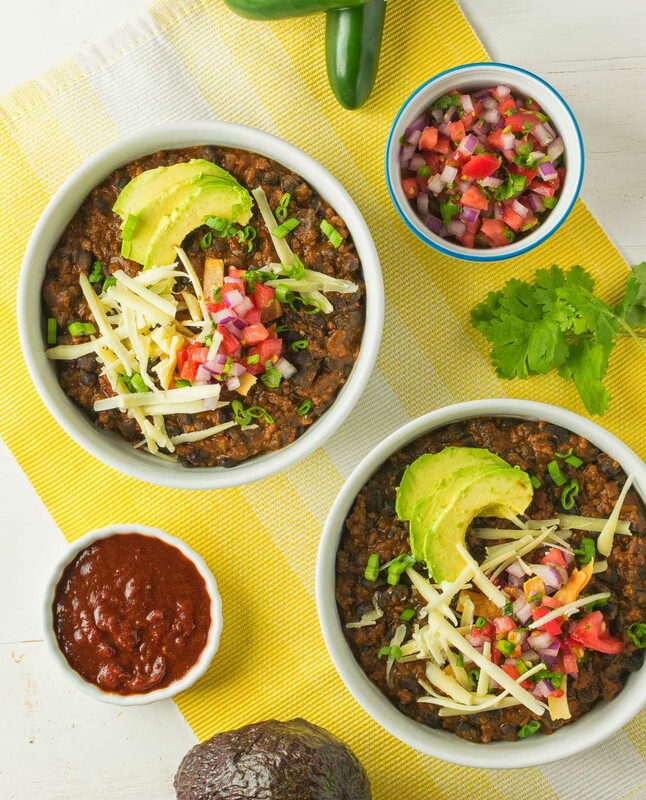 This look like one hearty, flavorful, chili! Pinning for later. This dish is all about layering for flavour. Hope you like it. I made this recipe for dinner tonight and it was absolutely the best chili I have ever made even though I added the admittedly questionable modification of employing a crockpot. Absolutely delicious. Thank you! I’m so glad you liked it and made it your own. Whatever gets decent food on the table is just great!